When this equip magic card is active and is destroyed due to a card effect, look at your opponent's hand. Select one card from their hand and send it to the graveyard. Not really that great of a card. You don't get the effect of this card if this is discarded due to the monster it was equipped to was destroyed. So basically, either you or the opponent has to manually destroy this card for it to work. The opponent isn't stupid enough to use MST or something like that on it, so basically, that means that most likely, you're going to have to activate it yourself. That means you have to use another card to destroy your own card. You had to waste 2 cards to destroy 1 card in the opponent's hand. I'd give it a 1.8/5. There are already plenty of other hand disruption cards that you can use. There's no reason to use this one. This card could have been much better if it didn't have to be destroyed by a card Effect. That way you could load it onto a weak Monster, such as White Magical Hat, and force your opponent to either attack it, or let it survive for the time being. But since it has to be destroyed via a card Effect, it can't be placed onto a Monster, then Tributed to activate the Effect, or activated when one of your Monsters have been killed during Battle. That's what basically brings the card down. It's not as versatile as it could have been. The main cards that will activate the Effect are Mystical Space Typhoon, Heavy Storm, Harpie's Feather Duster, or the Gearfried the Iron Knight's Effect. And any good player will know to just attack the Monster equipped with it, rather than waste a good Magic/Trap Removal card on it. Also keep in mind if Mystical Space Typhoon or Dust Tornado is chained to the placing of Smoke Grenade of the Thief then it is negated and destroyed. Meaning the Effect will NOT go off. This is straight from the new rulings. Well, when the LOD set first came out, I figured that this card would be so great. Just equip it to a monster and no matter what I nail a card, right? Well, no. If it was like that, then it would be pretty good. However, it has to be destroyed by some type of m/t removal, such as HFD, Heavy Storm, and Mystical Space Typhoon. 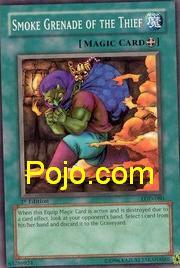 It cannot be activated indirectly via an opponent's monster crashing into your monster equipped with this card. Plus, Equips are generally bad to use anyways. The more you play, the harder a HFD/HS/MST will hurt you. Rating: 1/5. It's just so...bleh. If your opponent likes to give you an advantage by MSTing this, then by all means play it. Well, the chances of your opponent destroying this card are slim… but lets say your opponent just played SORL…. You play this card, follow up with heavy storm and you may now send a card to the graveyard from your opp. Hand, free. This is a good card, but its too situational…. What was I thinking when I Selected it for this week? I should have picked a different odd card…. After Genocide comes to mind.